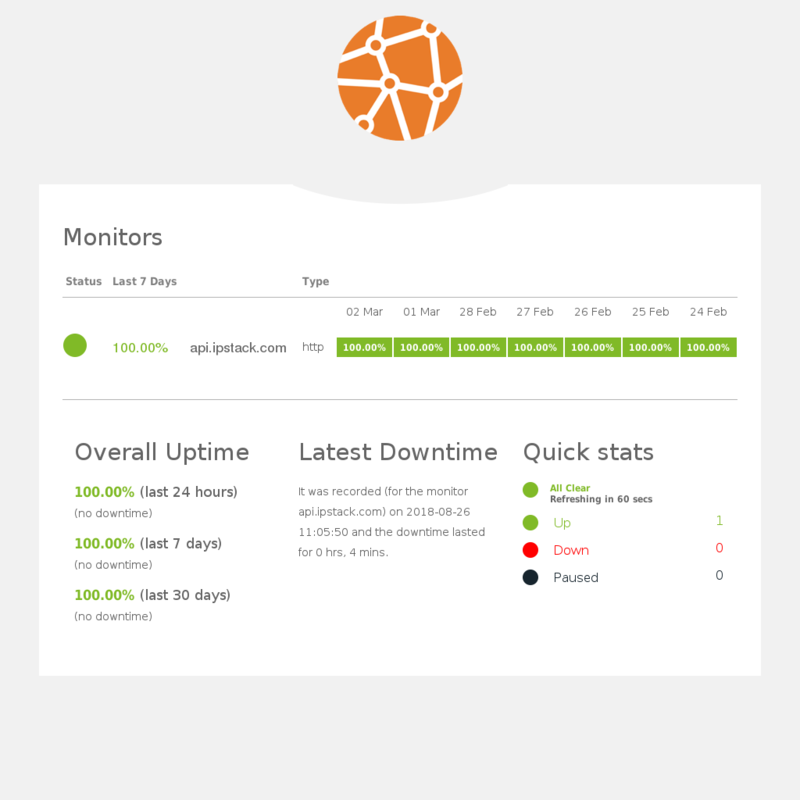 Enter your email to receive FREE instant notifications when ipstack goes down. March 02, 2019 04:44 UTC DOWN less than a minute Affected services: api.ipstack.com. February 28, 2019 15:47 UTC DOWN 3 minutes Affected services: api.ipstack.com. February 28, 2019 06:49 UTC DOWN 5 minutes Affected services: api.ipstack.com. February 28, 2019 06:44 UTC DOWN 2 minutes Affected services: api.ipstack.com. January 29, 2019 08:08 UTC DOWN 3 minutes Affected services: api.ipstack.com. January 24, 2019 23:59 UTC DOWN 4 minutes Affected services: api.ipstack.com. January 14, 2019 16:08 UTC DOWN 4 minutes Affected services: api.ipstack.com. December 13, 2018 11:40 UTC DOWN 1 minute Affected services: api.ipstack.com. December 08, 2018 02:55 UTC DOWN 4 minutes Affected services: api.ipstack.com. December 07, 2018 22:02 UTC DOWN 4 minutes Affected services: api.ipstack.com.